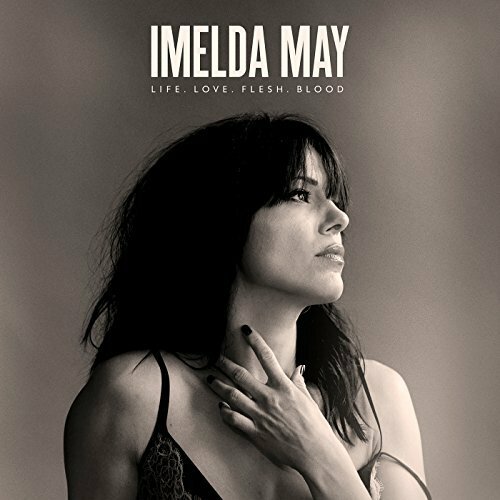 The rich tapestry of existence and experience are the broad themes covered in Imelda May’s fifth album Life, Love, Flesh, Blood. A dynamic, cross-genre offering that leaves behind to some extent the ‘rock-a-billy’ party song reputation May has developed and instead delivers a more considered collection of work: a brave step, for sure, but one that works. It’s almost as though the Irish songstress has come of age, following the well-documented personal traumas she has been through. This is not a break-up album though. It is rather a retrospective that takes stock of her life thus far and revels in the challenges that lay ahead. The opening Call Me may be doused with heartbreak, though never to the extent where it becomes maudlin, Should’ve Been You is more ‘up’ and has a catchy refrain and 50s retro beat that will have you nodding your head along in time and appreciation. There’s also the cross-genre tone that makes placing the album – and the singer – in a musical box. Human is an out-and-out pop song with C&W undertones, whereas When It’s My Time, which features long time supporter Jools Holland on piano, is as deliciously gospel as anything Aeretha Franklin, Nina Simone or Billie Holliday ever conjured up from their respective bags of magic. Jeff Beck’s contribution to Black Tears supplies a subtlety that is remarkably understated, whereas Levitate summons up images of South American tavernas, smoky passion and scrumptious, smouldering desire. Game Changer demonstrates an over riding determination to steer clear of the ‘black dog’ of depression, with a gritty vocal and massive sound that is fist-pumpingly brilliant. Bad Habit tells of the compulsiveness of shopping for the hell of it, whereas The Girl I Used To Be sees May appreciating all she has in the hope of passing this satisfaction along to her daughter. The Longing – arguably the strongest track on the album – is an out-and-out rocker, that’s steeped in the blues with an angry edge that cuts to the quick. Life, Love, Flesh, Blood may be a sojourn away from the expected, but nevertheless is an album that sweats authority and a clear indication that there’s far more to Imelda May than meets the eye. REVIEW: Blood Brothers at The Storyhouse, Chester.